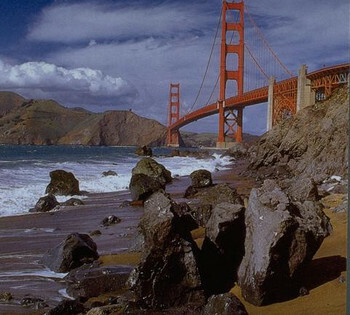 San Francisco has the trolley tours, Alcatraz Island tours, the Presidio, The conservatory of flowers at Golden Gate Park, Wine Tasting and winery tours, concerts and cultural events, plays and musicals, as well as Thoroughbred racing at Golden Gate Fields. Pier 39 is a shopping, dining and entertainment complex that has dozens of options from which you can choose. However, even if you did nothing but sit on a park bench at Pier 39, you'd have an enjoyable day. Pier 39 sits on the waterfront's edge with a stunning view of both the city and the San Francisco Bay. You'll smell the salt air, hear the squeal of sea gulls, watch ferries and tour boats coming and going, and enjoy viewing a resident colony of sea lions that calls the water around Pier 39 "home." In fact, spending some time admiring the view from a bayside bench would make a great way to start off your day. You'll be facing so many options ahead for you, that you might need some time to decide! Several restaurants at Pier 39 are open for breakfast...and, of course, you'll dine with a view of the bay from your table. After your morning meal, there may still be a chill in the air; if so, why not start by touring the "can't miss" Aquarium of the Bay. At San Francisco's Aquarium of the Bay, you'll enjoy attractive exhibits showcasing marine life from a variety of the ocean's zones. You'll be able to walk through TWO clear viewing tunnels, where specimens will swim and slither to your left, right, and above you. You'll see large tanks, small tanks and touch tanks. You may attend informational programs, or simply ask as many questions as you like of the aquarium's staff. You're certain to leave with a renewed awe of our swimming friends...and knowing more than when you entered! To some, San Francisco is the quintessential American city, and most first-time visitors discover a similar feeling upon leaving. The tumultuous rollercoaster of the city's history, tied in closely with the history of the United States, has created a mecca of modernism and tradition, revolution and reaction, sassy style and sophistication. 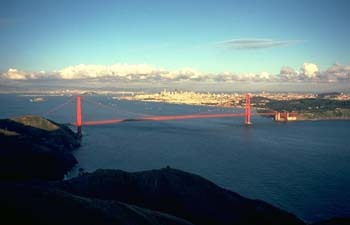 Find airfare to San Francisco now and don't miss out on another minute of the action! Michel-Schlumberger Vineyards in Sonoma Valley from McMedia ProducerGirl on Vimeo.